Accruals are defined as recognition of revenue or expenses before cash is received or paid. However, accrual accounting does not only relate to events with cash moving afterwards, but also to situations with cash moving before recognition of revenue or expenses. A deferral refers to recognition of revenues or expenses at some time after cash has been transferred. To make it clear, let us stop on definitions of accruals and deferrals again. 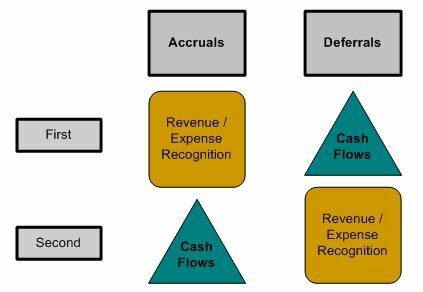 Accruals refer to recognition of events before cash flows. Deferrals pertain to recognition of events after cash flows. Sometimes deferred amounts are spread over a period of time and their recognition in the income statement is being made proportionally to time passed. Such situations create a need for allocations. Allocation is a process of assigning a portion of an entire amount to each of several accounting periods. We will take a closer look at deferrals using an example. Owner made a $4,400 capital contribution. SuperDels collected $3,000 cash in advance for services to be performed between June 31, 20X7 and July 1, 20X8. SuperDels purchased a car for $4,000 with a salvage value of $500 and 5-year useful life. $1,000 was invested in land. SuperDels incurred and paid operating expenses of $300. An adjusting entry is required to recognize revenue earned in 20X7. An adjusting entry is required to recognize expense incurred in 20X7 associated with the car use. Let us see what effects the transactions above will have on the accounting equation and financial records. 2) On June 31, 20X7 SuperDels received $3,000 in advance for services to be performed during a year ending July 1, 20X8. On June 31, 20X7 no services had been delivered yet, thus, Mrs. Piksvel could not recognize any revenue at that time. Even though cash in its full amount had already been received, the entire volume of services still needed to be completed before any revenue could be recognized. We can say that the revenue is deferred until services are provided. The deferred revenue amount is the company’s liability because it is obligated to perform services. The account that accountants use to record revenue amounts received, but not recognized as revenue in the income statement is called unearned revenue. Unearned revenue represents cash received and recorded as liabilities before revenue is earned. These amounts are shown in the liabilities section on the balance sheet. Note that after this transaction the company has a negative Retained Earnings balance. In further transactions the company will record revenue that will offset the Retained Earnings negative balance. Because 6 months of services were completed in 20X7, $1,500 ($250 x 6 months) must be recognized in a single year-end adjusting entry. An adjusting entry to move this amount ($1,500) from the Unearned Revenue account to the Revenue account accomplishes this task. This adjusting entry is a claims exchange transaction. Claims exchange transactions increase one claim account and decrease another. Thus, only claim accounts are involved in such transactions. Total claims remain unchanged. In this situation, the decrease in liabilities (unearned revenues) causes revenue recognition in the income statement. Recall that revenue is defined as either an increase in assets or decrease in liabilities (as in our situation) resulting from operating activities. 7) SuperDels must also recognize expenses for the car cost used during 20X7. As the car is estimated to be in use for 5 years, it is logical to spread the full cost over 5 years. The car has a cost of $4,000, and the salvage value of $500. Salvage value is portion of an asset cost that is expected to be recovered at the end of its useful life. A salvage value can be recovered through a sale or exchange of the asset at the end of its useful life. Useful life is a term of service during which an asset is expected to provide benefits to a company. Note that we assumed a full year of depreciation is charged to expenses during the first and last years of the car useful life, even though the car is not used for full 12 months during those two years. This is a simplified way of calculating straight-line depreciation (see below for the definitions). More advanced ways of calculating depreciation is provided in the chapter devoted to long-term assets. Depreciation is allocation of the cost of an asset to expenses over the asset’s useful life in a rational and systematic manner (i.e., straight-line). It is important to note that the Car account was not directly affected by this transaction. Instead, a special contra asset Accumulated Depreciation account was used. Using the accumulated depreciation account allows keeping track of the original car cost recorded in the Car account. Accumulated depreciation represents an estimated cost of an asset used in operations. Accumulated depreciation is a cumulative of all depreciation expenses recognized for a particular asset. Accumulated depreciation is an example of a contra asset account. 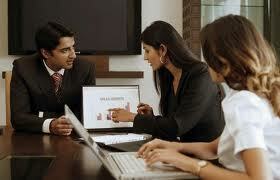 This account is included in the balance sheet under related asset accounts. Contra asset account is one that is offset against an asset account on the balance sheet. Contra asset accounts have credit balances and thus, reduce asset account balances. Book value, also referred to as carrying value, is the result of asset and related contra asset accounts offset. In other words, book value is the difference between an asset account (i.e., cost) and corresponding contra asset account (i.e., accumulated depreciation). In SuperDels’ case, the book value of the car will be $3,300. The book value is calculated as the difference between the original cost of $4,000 and accumulated depreciation of $700. The financial statements for SuperDels for 20X7 are presented below. There are two points that should be noted about the financial statements. First, deferrals, like accruals, cause a difference in the amount of net income and the amount of cash flow from operations ($500 vs. $2,100). Second, the Car account contains the full, original cost of the asset. The amount of accumulated depreciation is shown right after the Car account in the Accumulated Depreciation account. Accumulated depreciation is subtracted from the asset account to arrive at the carrying (or book) value of the car amounting to $3,300 ($4,000 – $700). When adding up all assets in the balance sheet to calculate total assets, only the carrying values (i.e., original cost less accumulated depreciation) are considered. Received additional contribution from the owner in amount of $3,000. Paid $1,200 cash for an insurance policy with one-year term beginning April 1, 20X8. Recognized $5,000 revenue on account for services provided. Paid $1,400 in cash for other operating expenses. Sold land that was purchased in the previous period for $700. To recognize unearned revenue remaining from 20X7. All services were fully provided by July 1, 20X8 (according to the contact). To recognize depreciation expense on the car used. To recognize the use of supplies. At the end of 20X8, $200 of supplies remained on hand. To recognize insurance expense for 9 months in 20X8. 2) The purchase of the insurance policy results in a deferral. As the insurance is paid in advance, an account named Prepaid Insurance is used to record the acquisition. Prepaid insurance is used to keep track of cash paid for insurance coverage that has not been expensed. Prepaid insurance is an asset account and presented in the assets section on the balance sheet. 3) Buying supplies also results in a deferral. When SuperDels got supplies, it recorded them in the Supplies account. Supplies is an asset account used to keep track of supplies (i.e., pencils, paper). The Supplies account is increased when new supplies are acquired and decreased when supplies are used / expensed (usually in a single adjusting entry at period end). 7) Selling land results in a loss of $300. As the Land account had a balance of $1,000 and was sold for $700, the total assets decreased by $300. This decrease is called a loss. Losses are similar to expenses in the way that both decrease assets or increase liabilities; however, losses differ from expenses in that they are caused by incidental transactions, rather than from ordinary operating activities. Gains are similar to revenues; however, gains result from incidental transactions rather than from operating activities. Note that the land cost was divided into two parts: (a) cash received ($700) and (b) loss ($300), which in total equal the initial cost ($700 + $300 = $1,000). 11) Generally, the entire original amount of the insurance policy is placed in the Prepaid Insurance account. Later, when time passes and part of insurance is used, an adjustment is made. An appropriate amount of insurance is transferred from the Prepaid Insurance account to the Insurance Expense account, i.e., expense recognition takes place. Prepaid insurance is an example of a prepaid expense. Prepaid expenses are expenses paid in cash and recorded as assets before they are used or consumed. Prepaid expenses are usually shown in the assets section on the balance sheet. As you can see, the total assets and claims (liabilities and equity) are equal, or balance. The reason is that even though we did not show the full accounting equation in analyzing 20X8 transactions, we still involved at least two accounts in a transaction (except Event No. 7, when we involved three accounts) and applied double-entry accounting. Also pay attention to the way we showed retained earnings and revenues and expenses. We carried forward the beginning balance of retained earnings and then listed all revenues and expenses for the period 20X8. The reason is that all revenues and expenses are closed to retained earnings at period end. The ending balance of retained earnings would be $3,400 if you added the beginning retained earnings and all revenues and expenses for the period. Finally, financial statements. One important moment is that all revenue and expense accounts are closed to the Retained Earnings account (see the balance sheet and statement of changes in equity). Final note here. Usually, if there is a zero balance in the financial statements or zero activity, such balances or activity are not shown. For example, that relates to the Land or Unearned Revenue accounts on the balance sheet at 20X8 end. We retained those accounts for you to understand that such balances went from non-zero balances in 20X7 financial statements to zero balances in 20X8 financial statements.